Country Hills opened on July 4, 1993 as a 9-hole course, and quickly grew to be one of the area’s most popular places to play. It was started by a small group of local investors who envisioned a facility that was open to golfers of all ages and skill levels and placed great emphasis on outstanding customer service. The front nine is nestled over 80-acres of rolling hills and features numerous bunkers, water hazards, and tree-lined fairways. A three acre lake affects play on both par-3 holes. Our Hole #6, a 170-yard par 3, is 75% carry over water to a small green surrounded by four sand traps. This green has been measured by U.S.G.A. officials and can be one of the more challenging greens in Central Illinois. The back nine, opened in 2002, is a beautiful and challenging extension of the original course. It features water on five holes, tiered greens, tree-lined fairways, and a number of greenside and fairway bunkers. The back adds some extra length and boasts a par-3 with a partial island green -- sure to be one of the most breath-taking golf holes in the area. A banquet facility was also added in 2002, and has steadily gained a reputation for outstanding food and service for both golf and non-golf events. Our sweets and baked goods have become especially popular -- so Red Barn Desserts was launched in 2009 and has delighted area folks with specialty desserts for all occasions ever since. From farm to fairways: Prior to being a golf course, a majority of the front nine was pasture ground for livestock. 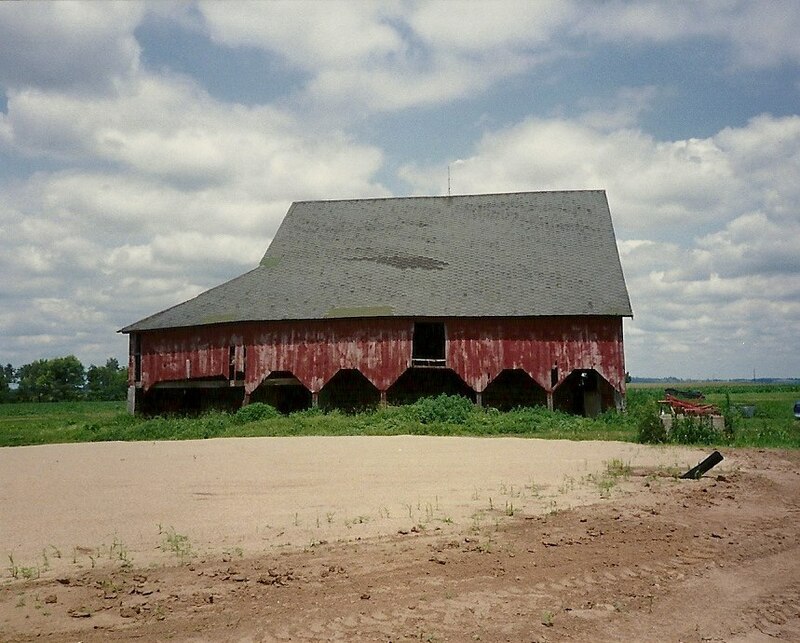 In fact, the clubhouse was designed to look like the old barn that sat at the entrance to the property. The picture below was taken from what is now the 9th fairway. 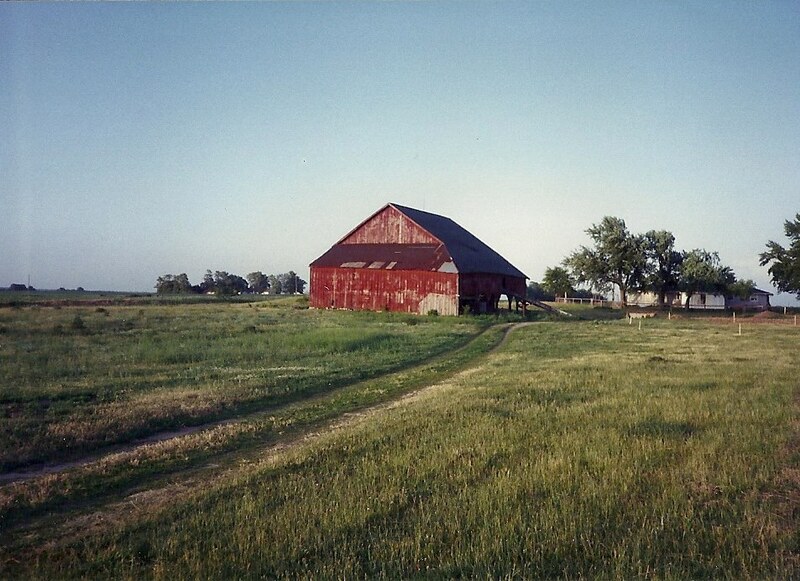 Although the barn had to be taken down, many remnants remain a part of the course. The stones in the retaining wall in front of the clubhouse came from the east wall of the barn. Most of the trim in the clubhouse is original barn siding. And many of the features and decorations on the course including gravel cart paths, stone flower planters and antique farm implements were meant to pay homage to the old farm. And we bet you can guess why we named our dessert business "Red Barn Desserts" - the old barn is even featured in the logo. Commitment to community: Serving the Greenview community and the youth of Menard County has always been a priority, with the course open to the public year-round and numerous non-golf events hosted in the clubhouse banquet room. The Greenview Golf Team (and now the Greenview-Athens Golf Team) has called the course home for 25 years. A junior golf program and a junior golf tournament are held annually, as well as High School Golf Regionals and Junior High Golf Sectionals. Recently, a Footgolf course has been constructed to give families another option for recreation.